Oh – I am in love. The Erin Condren LifePlanner ™ has stolen my heart. I have tried so many planners. And each one has it's own unique features – like the PlannerPad, which I also like. So, why the Erin Condren LifePlanner? What is it about this particular calendar that fuels my planner addiction? The short answer – creativity. This calendar appeals to my creative side. When I first noticed Erin Condren LifePlanners on the shelf at my local Staples (note that they are usually not in the section with the rest of the planners and calendars but often on a different shelf in the front or the back of the store – why? ), I was immediately attracted to the pretty covers. Most other planners that I have seen all have the same cover or similar covers. But the Erin Condren LifePlanner takes a unique approach by giving you choices to customize the look of the book on the outside. Of course, I had to open the book and explore further. Each one was a 2 page per week format, and some were colorful and some grayscale. I knew right away that I had to have one – or three. Because I need to have choices, I went home and visited ErinCondren.com, to go directly to the source. What I found was a candy store – figuratively speaking, of course. There were so many cover designs, most of which you could customize with your name or intials – or whatever you want, really. Your inner creative persona will go nuts with the number of stickers and planner accessories that are available. I was drooling on my keyboard. So, I went ahead and ordered an Erin Condren Life Planner for myself and my daughter – along with a “few” planner accessories. Because of the personalization, the planners took two weeks from our order date to actually ship and then a few days for delivery. It seemed like an eternity. My advice to you is that if you plan to order at ErinCondren.com you should do so like – now, if you want a good chance of getting your order before the new year. 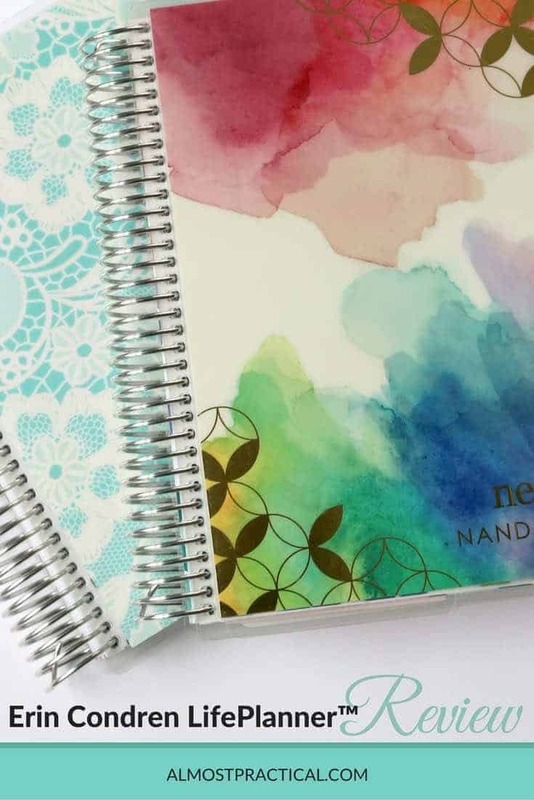 But, if personalization is not that important to you, you can get a great selection of the Erin Condren Life Planner and accessories at Staples.com, and I imagine that delivery will be quicker. 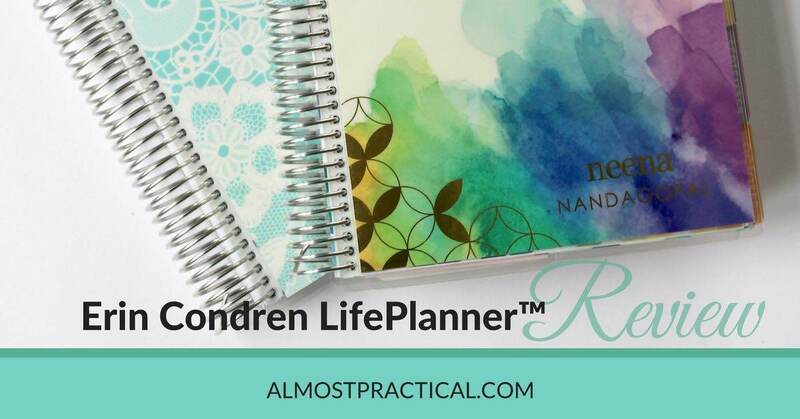 I chose an Erin Condren Life Planner with a vertical layout and the colorful interior theme. My daughter chose the vertical layout and the black and white interior theme. The vertical layout is very flexible. You can use the boxes in each column for morning, afternoon, evening. Or you could use each box for a different project or even work, home, and self. The boxes are great for adding stickers and color. Not only do I use it as a planner but I also use it as a journal of sorts. I use it to record future events – but I also use it to record what happens every day. The Erin Condren Life Planner comes in a choice of a colorful interior or a black and white interior. I find the current color scheme which is sort of muted pastels to be very soothing. The colors and shading really appeal to me. My daughter chose the black and white – and I really like this too. With black and white, your stickers and colored writing stand out well and do not compete with the background. If you think you'd like to order an Erin Condren Planner – you can click here to get $10 off your order. Just note that you will need to sign up for an account and they will email you the coupon directly. So, check your email. We are very short on patience in this house. When a box arrives we want to rip it right open, so it's really hard to wait, take pictures, and do a review. I was able to sneak in a few photos, though. The planner comes in a gorgeous box. It's like getting a great, big present.